Save Time and Money with PDR (paintless dent repair). This 2014 Buick Enclave had a PDR (paintless dent repair) performed by trained technician Chris Bentley. 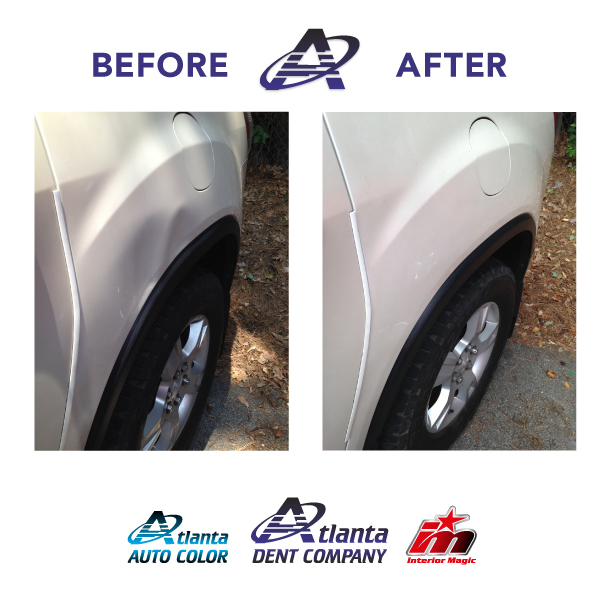 Atlanta Dent Company can work on any make and model of car. The goal of PDR is to save you time and money. Paintless dent repair is an amazing art of removing dents so that you never knew it was ever there. Our trained techs use their specialized tools to gently massage the dent out of your car leaving your car “looking and feeling like new again!” For a FREE Estimate, send us your photo or stop by 993 Mansell Road, Suite B, in Roswell, GA.
Did you know we can take care of your interior issues with our sister company, Interior Magic and paint touch up with Atlanta Auto Color. Atlanta Dent, Interior Magic, and Atlanta Auto Color, We are a one stop shop!